Well, the JAMSTEC model just came in today and its advertising a blow torch for much of the nation, except for parts of the GL's into New England. Very dry across the central CONUS. Is it believable??? Interestingly, it's ENSO forecast is holding onto the idea of warm ENSO neutral conditions through the summer which would not necessarily indicate a blow torch. I remember Summer '13 had a similar look to it. Finally, the SST's in the N PAC continue to trend warmer and the development of the "blob" in the NE PAC is becoming evident among the models. 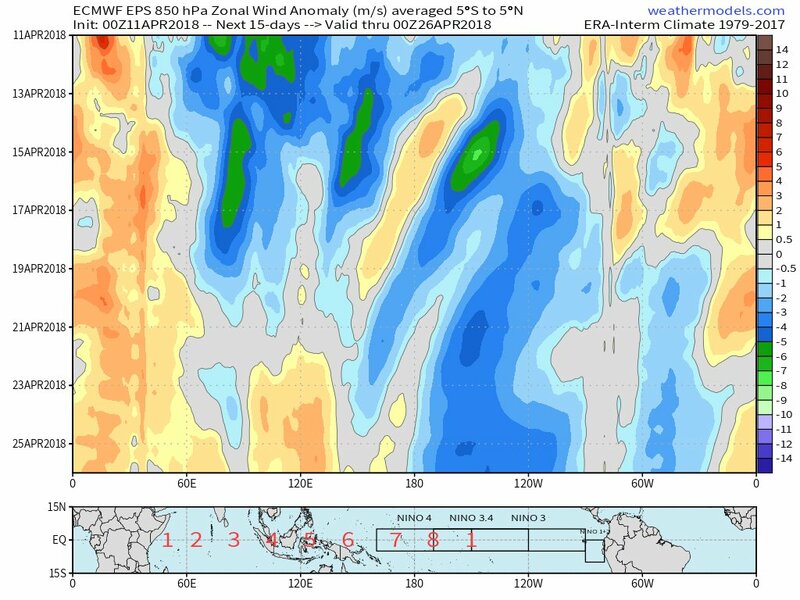 With the continuation of easterly trades across the equatorial PAC, Nina base state likely to continue through the end of this month...Nino delayed or Denied??? So it looks like we have a seasonal model for everyone. Literally. Chaos. I'm still going with my sw/west coast ridge idea transitioning or retrograding into a tall west coast ridge into Alaska and the Northeast Pacific in late summer. It would fit more in line with the warm neutral 2013ish confused El Nino look as well. The 2008-09 transition is not a bad example to look at either, nor is 1982-83 or 1975-76 transition. It still seems like the only logical response to me but I've been wrong before. I don't disagree with the warmth over NE US or the bulk of SE Canada at this point. This is a hard year to lay out so the analog process is likely going to be more confusing than it's worth this year. It would take 3 pages to explain. Lol. The latest CPC equatorial depth anomalies are showing warmth growing below the surface of the ocean...should be an interesting battle between the cool & warm waters over the next couple weeks as strong easterlies are in the forecast. The latest CPC equatorial depth anomalies are showing warmth growing below the surface of the water...should be an interesting battle between the cool & warm waters over the next couple weeks as strong easterlies are in the forecast. Very weak CP Niño by early to mid-summer would basically guarantee the look I discussed in my previous post. I'm seeing an incredible setup for a Pacific tsunami season in the making after that warmth breaks the surface also. Would almost lock in a cool to cold late summer as we discussed for everyone east of the Rockies. Love what is shaping up at this time. Would be nice to see the convection later in the season set up in the central PAC, or close to the ENSO 3/3.4 region. There aint gonna be Spring this year. BN to MBN. Idk, hopefully, that doesn't pan out. Hope there is a summer....I'm still waiting for spring! If the Euro Weeklies are right, I'm really going to try and get outta town after my cousins wedding next weekend and head to AZ for a while. I don't think you will have any trouble at all staying toasty down there. Hot off the press, the JMA seasonal showing encouraging signs that summer will in fact make a push next month. The SW ridge looks to build and push next month out in the Plains, but this may not happen till mid/late month as my idea of a hot start to summer is in the cards. However, those folks up near the GL's/Upper MW may still be dealing with back door cold fronts as blocking still has somewhat of an impact in May, but in June, this blocking effect disappears. In June, the same pattern continues in the SW/southern Plains states, but more of a normal temp regime across the rest of the sub forum which is very similar to what the CFSv2 is painting. 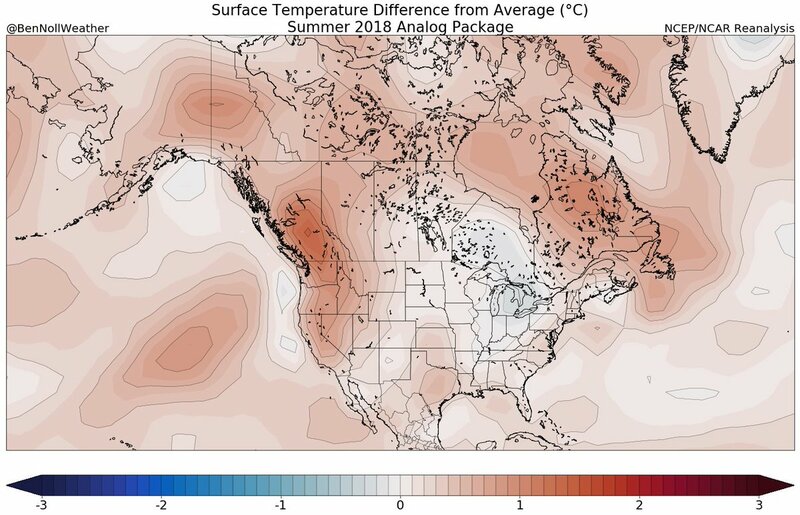 Here was the March run from CPC for JJA temp maps for the Summer....I believe they will update their April run today...interested to see if they continue to show the "trough" look in the heart of the nation. I would love it if we had absolutely no heat this Summer and record snow in June. FWIW, I took a look at the Euro Seasonal 2m temps for the summer and compared the previous 2 runs. It's clear that the cooler idea may be in the cards for the central CONUS. Definitely did trend cooler and wetter across the Rockies/SW. Sure, there are pockets of warmth as one would expect to see in the summer. Another strong Monsoon on the way??? I hope a ridge doesn't build into the west.... Abysmal for severe weather. We haven't had an eastern ridge, western trough base state in spring for years it seems like. 2011 is the last one of those I can remember. I think it'll be relatively dynamic. I don't think we'll be locked into any specific pattern. In fact, I think last Summer may be a decent comparison to what I'm expecting out of this Summer. Maybe more frequent and intense heat waves to come with ridges, and less flooding, but other than that I think we'll see a fluid pattern beginning in May and lasting till at least June. Not gonna be a historic severe wx year by any means, but I definitely think it won't be the worst year in recent history. I have a friend on facebook who used to be a former chief met here in Omaha for years, he said he's expecting an abnormally chilly summer like the summer of 2009. I just cant see a hot summer panning out especially with the route were going here. Oklahoma is also getting wetter as we head into spring as hell. I hope so, but I just can't foresee that happening for a second straight year. Like I said earlier, I think it'll be pretty dynamic and we'll see a close to average Summer, but with wild temperature swings that eventually average out. I'm starting to see a trend among the various climate models. The latest IRI has come in a tad cooler across the majority of our sub forum from the Upper Midwest/MW/Plains/GL's compared to its previous run for the May-July period. Parts of the central Plains are still relatively AN but all in all, seems to be latching onto the idea of an average summer. Gosh, the CFSv2 has been the only model that has been steadfast. Check out the previous March run compared to the latest April run. I remember summer 09. Very cool and wet. Mostly 60s and 70s the entire summer. It was like we never had a summer. With the lack of warm days in March and how cold it has been this April one term we are going to hear a lot of in May and into early summer is “cooler by the lake” and the further north one goes in Michigan that may be true for much of the summer. Has my vote. Couldn't draw it better. Ready for spring now. The near misses are even more annoying in the early spring months lol. Jesus, it's about time you gave up on this dead horse. The latest CPC outlook for summer hasn't changed much and holding onto the "trough" look across the central CONUS. Will this be a 2nd year in a row where the CFSv2 beats the rest of the climate model pack in terms of providing long range ENSO guidance? Again, we are seeing strong signal for easterlies to re-emerge over the next couple weeks and negate any indication of an emerging Nino this summer. There was a period where the CFSv2 tried to push the idea of a weak Nino a few weeks ago, but has since backed off on that idea for late Summer into the Fall. For instance, the Euro, like last year, was steadfast on an El Nino developing for last Fall at this time...see maps below...big Bust! At the same time this year, it's doing the same thing...warm bias??? Yeah. Good stuff there Tom. I'm going with the warm neutral solution. Euro is awful at enso until after the shoulder seasons pass. Ironically, that is the time when it would be most beneficial. Kind of a shame really. It seems to have the global warming bug the last year or so. Now that we bring up warm biases, has anyone ever noticed the hilarious urban heat island bias that GFS gets during the Summer? It makes certain (not all) metros 10-15 degrees warmer than the surrounding areas. Yes. I have noticed that in recent years. There will be small red dots all over in the summer. It drives me nuts. They just now got their elevation/temp algorithms pretty close to right in the last year or so. I guess they can only do one thing at a time. Baby steps. I like where those "hot spots" migrate to after June. Especially that big warm spot over the Aleutian Islands of Alaska. I can tolerate a hot May to mid-June for that. A late June to mid-summer severe weather season looks in the cards for me after that. It's going to be tough to analog this summer for sure. With the 80° milestone already reached for the 2018 summer season the next questions are when the last 32° low will happen (or did it already happen) the average last date is May 1st the latest last 32 date at Grand Rapids is June 4th 1945. And when will the first 90 day happen (if it happens) the earliest date was April 29th 1899 the mean date is June 19th two summers it did not happen (2014 and 1950) and the latest in years it did happen was August 11th 1907 the latest was September 29th 1953. It appears we're starting to see a consensus finally. I like it. I enjoy the statistics. I don't think I say it enough, but what you post is amazing. Awesome. I am hoping for a warm, dry Summer w on and off severe weather alerts. If you were to hedge your bets on this summer...which model would you pick??? IMO, CFSv2 has the right idea, esp if the west coast ridge really amplifies this summer. ECMWF...hot June and very dry summer....keep in mind how badly it busted on its weeklies for the month of May indicated very dry conditions overall. Hoping for the first ones. Starting to get dry around my region. Several rain chances this week but like always those have tended to be localized. Have been holding off, but may have to turn on my underground sprinklers this week. One of the earliest times that I can remember.